Welcome to Greendale, witches and warlocks. A town that exists in “this year,” but seems to lack cell phones and modern cars. Also, it may or may not be in Massachusetts, with the strongest evidence for this being their love of apple picking and general scorn for Connecticut. 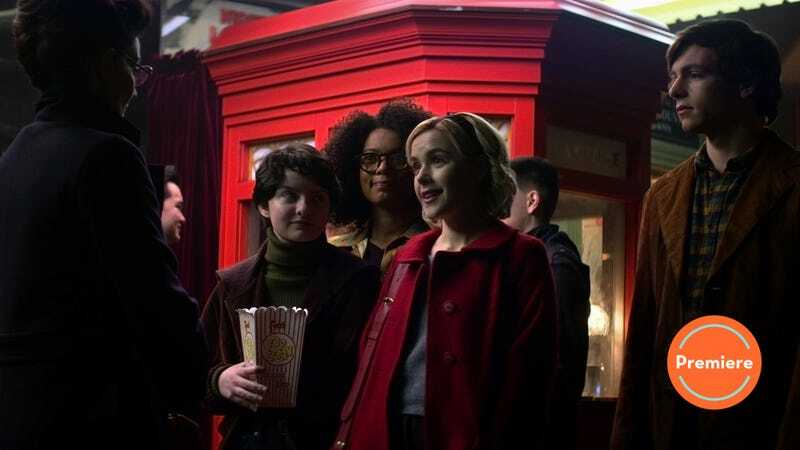 Netflix’s Chilling Adventures of Sabrina reimagines the titular character in a gothic world that nevertheless has all the hallmarks of modern civil rights discourse. Sabrina and her friends want to take down the patriarchy, but Sabrina is about to sign over her name to Satan himself, which does not seem like a particularly feminist path to take. The pilot has a lot of ground to cover, and two separate worlds to build. One world is Greendale itself and Baxter High, which seems to have a lot of the power dynamics typical to teen shows—an insensitive principal, some brutal jocks on the football team. Sabrina has sympathy for outsiders, though her own place in the school’s hierarchy is less clear. She’s also got an adorable boyfriend who tells her he loves her, which is a problem, considering the other world she lives in. That would be the world of the witches, and the show does not shy away from suggesting it’s a pretty dark world to inhabit. She’ll have great power, but also take blood from the bodies of the deceased, set spiders on her enemies, and, as stated above, live in some sort of subservience to Satan. This apparently includes her sexual choices, which is a heavy topic to drop in the first episode, and directly at odds with Sabrina’s politics. To put it lightly: This is a very dense pilot. In one hour of television, we get what seems like ten different conflicts. There’s the one between Sabrina and her school, Sabrina and her boyfriend, Sabrina and her aunts, her aunts with each other, Sabrina and her future school, various figures of unknown allegiances within the witching world, and oh yeah, Sabrina and her choice about whether to give up her life in the mortal world. It’s A LOT to take in. Which is not to say that these aren’t all interesting paths for the show to take. Well, possibly minus the boyfriend plotline. So far, Harvey is just a floppy haired Perfect TV Boyfriend. Very sweet, but not terribly compelling when held up against gaining absolute magical power. 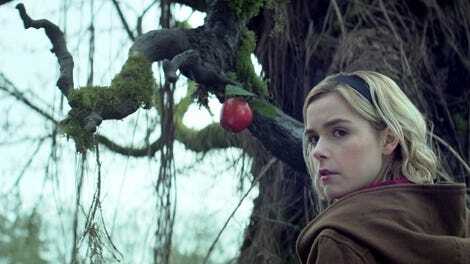 The best thing the show has going for it so far is undoubtedly Kiernan Shipka, who manages to maintain the focus of the show despite the oddness of what’s happening around her. She gives Sabrina a real can-do attitude about the vast range of things the world is throwing at her. Sometimes this is a little confusing, as when she walks off being attacked by some kind of zombie in a haunted hay maze without seeming terribly curious about who sent it. How often does she interact with random monsters that want to kill her? It’s also unclear just how strong or developed her own powers are. She can turn on the radio at home without touching it and knows some basic anti-curse work, but doesn’t seem to have many resources against an attack. The show’s visual palette is also gorgeous—deep, vibrant greens and other earth tones. Shipka’s bright blonde hair and Sabrina’s preferred scarlet color scheme are forever standing out against the dark, heavy colors of the world around her. Some of the look calls to mind the set design of the Harry Potter movies, which also tended towards retro décor and dark colors. And with a potential magic school to attend, that’s potentially only going to increase. Or not? Sabrina is more torn than ever about which world she wants to live in, particularly after the malum malus apple she samples shows her a pretty terrifying future. But she’s only got a few days left to decide. Why is Miranda Otto doing an American accent? If she wasn’t going to use her actual accent, why not have her mimic Lucy Davis, who is her sister? Are they sisters in a more metaphorical sense? My sister and I have the same accent, due to being from the same place. In fact, Miss Wardwell did not see trouble on the way. Also [pushes up glasses pedantically] years ago someone explained to me that people are hanged, pictures are hung. “The great work begins” is a nice dramatic thing to say and all, but I think it’s been pretty well claimed by Angels in America at this point. If, like me, you were a fan of the black cat acting, please enjoy this illuminating article about how they worked with the cats, and how poor Kiernan Shipka is deathly allergic to them. Let us all remember the one time she touched Salem, since I assume it won’t be repeated.